If you remember back when I started this thing, I promised a healthy dose of science and geology to go with the pretty pictures. Unfortunately, except for one trip report in June, I haven’t been able to follow through on that promise particularly well. But that ends today! Inform the men and women, it’s geologizin’ time! Prepare to be scienced! If you have a weak constitution or an un-curious mind, please leave now, because wimmity-wam-wam-wazzle hallelujah it is fieldwork season, and all is well with world! Finally presented with several consecutive days of good weather forecast, I planned a three-day field trip and asked along lots of geology and non-geology friends to be field assistants. Many jumped at the chance to do a little tramping and I ended up with a crack international team of doctors (the geology kind), engineers, PhD students, and more! Overqualified for a preliminary light field trip? Probably. Overqualified for having fun? Not a chance! The goal for this trip was to scope out the area that where I’ll be doing most of my field work, get an eye for telling the difference between different types of volcanic deposits, and pick some good spots to come back and sample another time. After driving down, we spent the rest of the first day looking for some huge debris avalanche deposits along the coast (a side project). It took a bunch of tries driving up and down some little roads, but eventually we found what we were looking for. For both nights of the trip, we camped in a small clearing right at the edge of the national park. As long as the weather is good, that’s definitely going to be a great cost-saving measure going forward. Camping right next to cars is easy since you don’t have to carry stuff far before you set it up, and cooking and sharing an evening with friends outside only makes the trip even more enjoyable. Our campsite. Pretty nice view, huh? 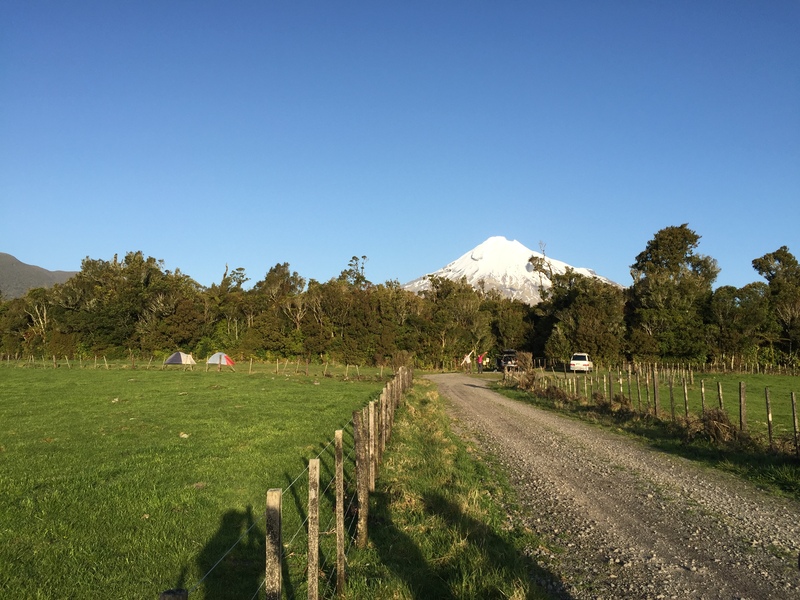 Also, can you guess where the farmland ends and Egmont National Park starts? Hint: it’s as obvious as it looks. The goal of the second day was to go into the park and find stratigraphic sections of the deposits I’m going to be working with in the future so I could get practice looking at them, describing them, and deciding what type of deposit they are. A stratigraphic section is basically a place where you can see lots of different layers of rocks or volcanic deposits all stacked on top of each other in one place. It’s important to study these because it’s the easiest place to learn what all the different layers look like, since in many places only some of the units will be present and it isn’t nearly as easy to tell them apart. …before we eventually branched off in order to drop down into some of the stream beds where the interesting deposits are. And by drop down, I do mean drop! We crossed a stream or two this way until we got to the one we were looking for. Once we got into Maero Stream, instead of crossing over, we started hiking upstream. Once we found Maero Stream, we hiked up and down a bit looking for the “type section”, which is basically the very best stratigraphic section anyone has found of a particular sequence of deposits, and therefore the best place to learn about them. It’s important to know where you are and where you’re going! I’d premarked our destinations during preparations for the trip. The type section! Sort of. Look, I know it doesn’t look that exciting, but believe me it’s cool! Looking at a section is a multi-step process that starts with seeing what you can learn about the outcrop from a distance. How many different layers are there? How thick is each one? What can you tell about each layer on a large scale? Basically, ask as many questions as I can think of and see how many I can answer. I’m not very good at drawing, but I do my best to make a sketch of the whole outcrop. Scale is really important for knowing how thick different deposits are. We measured our deposit depths in Tims. I can see about 5 seperate layers in this section. Can you? That’s followed by going up close and looking at each layer individually. How big are the biggest rocks in a layer? How small are the smallest ones? What type of rocks are they? Do the rocks get bigger or smaller as you look up or down? Are similar size rocks grouped together or is it totally random? Answering these questions may help me figure out other things about the deposit, like where it came from, how hot it was, and more. Up close and personal with some of the deposits. Don’t forget the scale! See how the rocks are really angular? That’s something worth noting. And see here that all the different sizes of rocks are mixed up together? Also important. Manu showing me what to look at. Here’s some really really fine stuff…no bigger rock pieces to be found. After looking at the type section, we went on to look for some “reference sections,” which are basically more good spots to see a particular formation, just not quite the best ones. That involved crossing some more streams and led, finally, to some awesome views of the big guy himself. Some more interesting deposits we saw on the way. One of the streambeds from above. Ideally, as on this day, they won’t have too much water in them while I’m there. Getting to the reference section involved hiking up the Stony River (also called the Hangatahua River), the largest, wettest river in the area by a solid margin. Even on this dry day it was pretty big, and will probably be pretty hard to cross except in the driest of times, which meant I had to look at a lot of stuff from a distance. The Stony River. There’s water, really, there is! Taranaki photobombing a nice picture of some geologists. And that was pretty much it for the day other than the hike out. Part of doing this kind of fieldwork involves being patient and being happy with what you got done for the day. While there will be some days where I take tons of samples or look at a bunch of sites really close together, there will be others like this one where you walk pretty far just to see one particular site and have to be satisfied with that as a productive day. The goal of the next day was to check out a few spots I had marked off outside the park to look at a different unit. While the Maero Fm. we were looking at the previous day is only up to 800 years old and from the volcano’s most recent active period, this day we’d be looking at the Warea Formation, deposits from activity closer to 10,000 years ago. 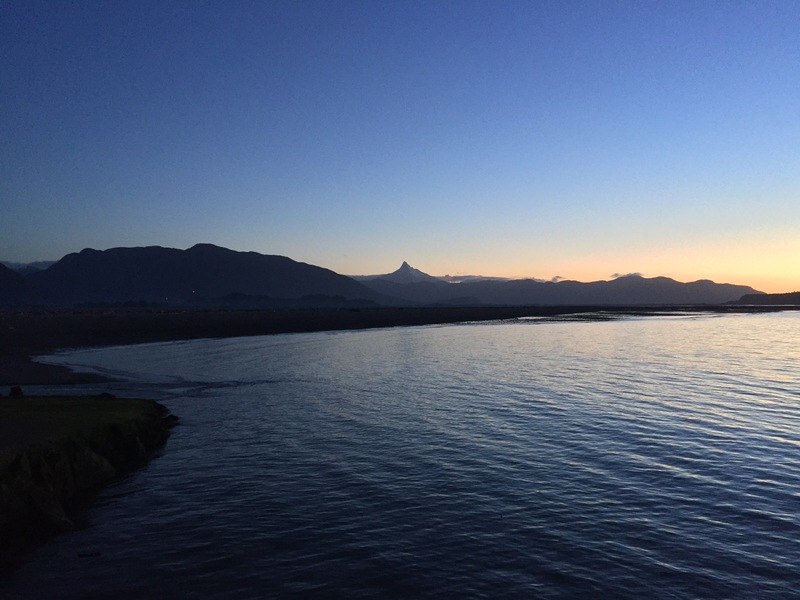 The idea is to look for comparisons between the two units from different time periods but in the same area–how were the conditions similar or different the last time the volcano erupted in the same location? So we jumped in the car and gave chase. Alright, so we weren’t driving all that fast. And the things were were chasing were inanimate objects that have been there for a few thousand years and probably aren’t going anywhere. Still, it’s more fun to think of myself as a rock bounty hunter tracking down my quarry (bad geology pun alert!)? See how rounded the big rocks are compared to the ones from the day before? Signs of a lahar! Shovels are good for more than just digging. The most steadfast of the crew that remained till the bitter end. But now you can drive right through it! There was one unit that had some characteristics of both hot and cold deposits! Tricky, indeed. That’s where my paleomagnetic methods should come in handy. Later on, when we come back and sample, I should be able to do pmag lab work that will give me a better idea of what type of deposit we were looking at. With the hard work mostly over, we decided to relax and eat our lunch at the beach. And by beach I mean more rocks. Also, we made a friend! But he was super friendly either way! And there’s another field trip in the books. Can’t wait to get back with some sampling gear to start the real work! I’ve done a bunch of small things over the last several weeks, some for fun, some for work, and some for a combination of the two (the fact that the two tend to overlap is nice). These events were of varying levels of photogeneity (is it a real word? Don’t care, it should be.) resulting in varying amounts of photos (down to zero), so enjoy accordingly. To mark the anniversary of one of Ruapehu’s larger recent eruptions in 1995-6, NZ’s Department of Conservation had a short workshop held in Whakapapa at the base of the volcano. It was my first “conference” besides AGU and it couldn’t have been more different. Rather than airplane hangar-sized rooms full of posters and hundreds of talks of all types, it was just one room of maybe 50 volcanologists. It was a really interesting chance to see the history of volcanology and the progress it’s made in New Zealand over the last 20 years. It was also a great chance for me to meet lots of volcano people from around NZ. There were a number of students and professors from most of the major universities in the country, as well as people from GNS (the USGS of NZ) and DOC (dept of conservation). Plenty of names I’d heard of but not yet met and people I may work with in the future. One thing that was not different from AGU was the friendliness and camaraderie of the volcanology community. Everyone was keen to make new friends and to discuss geology and other stuff over a few drinks. While coming to Auckland in April basically meant I didn’t get to have any summer in 2015, it did mean I got two ski seasons, which is at least a small consolation. It took a while to finally get out on the mountain this winter, but we finally did it in late August. While there’s lots of options for skiing on the South Island, on the North Island there are only two main options, Turoa and Whakapapa. They’re both located on the flanks of Ruapehu (skiing on a volcano! Oh. Yeah. ), Whakapapa on the north side and Turoa on the southwest. We went for a couple days to Turoa, the smaller of the two. The snow conditions weren’t unlike those in New England, where I usually ski. No powder to speak of, scrapey in places, but plenty of spots with pretty nice snow. The terrain was quite a bit different, however. Whereas most places I’m used to skiing have discrete trails separated by forest, on Ruapehu it’s pretty much all one open field with no real signage and “trails” only really dictated by the terrain. As a result, your path down the mountain is limited only by your imagination (also cliffs). There were some nice bowls and higher difficulty runs off to the sides from the lifts, and it made for a couple fun and exhausting days of skiing. Not long after I arrived in New Zealand I went on a hiking trip and ended up watching the sunset over Piha beach, but didn’t actually get to check out the beach itself. That was remedied a few weeks back when we took a trip over there, just under an hour out to the west from Auckland. It was a cold, bleak, windy day, so maybe not the best for beach-going. We took a walk around, waded carefully through a shallow stream or two (or tried to, at least–it was deeper than it looked in some spots! ), and took a climb up Lion Rock, a big eroded volcanic thingy (about all the detail I can offer. Educational, no? ), though we couldn’t get all the way to the top. …but some of us managed to find the places where it was waist-deep. Oops. Danger, showering under rockfalls is awesome! Afterwards we took a short hike nearby to Kitekite Falls, a pretty impressive waterfall. There was a pool at the bottom that might’ve been nice in warmer weather. It was pretty cold, though, so we just took a good look around and took off. So here is an instance of work being awesome. As I’ve mentioned, lahars are a big hazard on New Zealand volcanoes. On Ruapehu, big debris flows have caused major damage in the past, and it’s a particular issue there because people are skiing on the volcano. Which means that there are quite frequently lots of people in the danger zones for lahars. 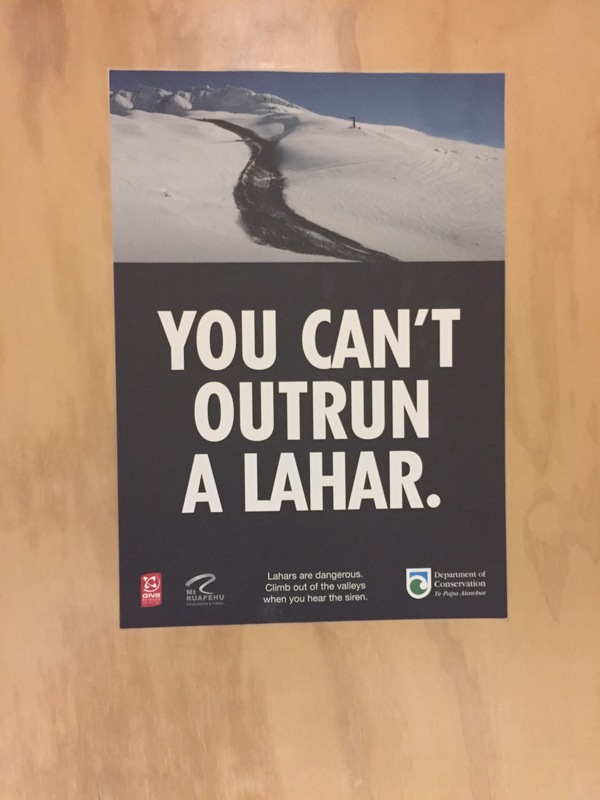 To mitigate this, the Department of Conservation has developed a pretty nifty lahar warning system. If something were to happen, it should trip the alarm setting off sirens on the ski slopes and loud announcements advising people to ski to high ground. This is supplemented by educational material located around the ski area, on the lifts, and in the lodges. You see this one while you’re peeing in the bathroom. It’s nice to have a captive audience! A warning system is only good if it actually works, though, so DOC tests the system a couple times a year. We had the good fortune to meet the people running the test at the Whakapapa conference a month or so earlier and were invited to help out. Basically, the plan was to set off the sirens and warnings and see how it went. Our job was to wait in certain spots to see how well we could hear the sirens and to observe how people reacted. The last part of the job (the exciting part) was to ski down quickly and talk to people who ignored the warnings to find out why. My area had a race course in it! And really cool craggy spires. I’m sure I’ll be back soon enough, I’m sure. It was really cool to see hazard mitigation in action and see how people reacted (mostly correctly, believe it or not). The area I was responsible for was pretty small, but it was interesting how at any given time the amount of people varied widely. At the time the sirens blew there were only a couple people in “danger”, but if it had happened maybe five minutes earlier there would have been around 30 or more ski school kids. That would’ve been pretty interesting to see! I definitely hope I get to participate in this project again the next year. Just last week I took a trip down to New Zealand’s capital city, Wellington. Part of the trip was for work–I was meeting one of my supervisors and some other people who can help me with my project as well as checking out the paleomag lab at Victoria University of Wellington that I will be spending quite a bit of time in during my PhD. I was also visiting some friends that I hadn’t seen in a while. Wellington seems like a really neat city, lots of really high hills (more dramatic in its hillyness than Auckland), crazy windy weather, narrow streets that are stressful to drive on, and a pretty harbor and beaches (covered in pretty shells and weird jellyfish). Unfortunately, I forgot my phone charger, so I couldn’t take any pictures. 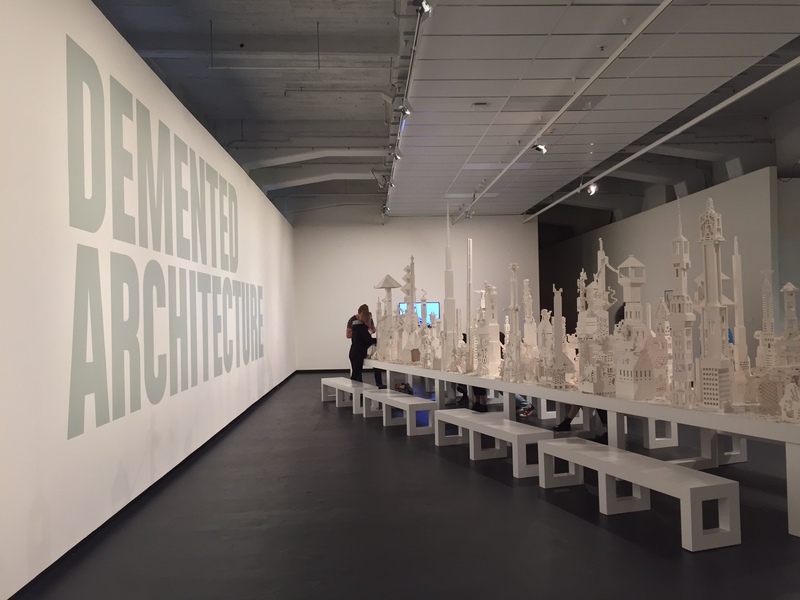 All I got was this one cool museum exhibit where they put out a table covered in white legos and let people build landscapes. The only picture of my trip to Wellington. Luckily, I get to go back in November for a conference, so I can hopefully have a little more to show for it then. Sorry about no Wellington pictures. Enjoy this photo of the most New Zealandy road sign ever with a volcano and sunset in the background instead.